There are many different ways God calls people. You don’t have to wait for a lightning bolt or a supernatural vision. Most often the call from God is found deep within your own heart (planted there by God left to be discovered by you!). It might manifest itself in different ways such as a desire to want to help others or a desire to know God more deeply. If you like being with people especially during some of the bigger moments in their lives… their weddings, the birth of their children, the death of a loved one… the priesthood could be for you. No two callings are the same, just like no two priests are the same. The important thing is, if you think you’ve been called, check it out. What have you got to lose? Because priests and religious have chosen a way of life which says by its very nature that God is most important, prayer has a central role in their lives. Prayer is communication with the Lord! Just as a marriage cannot survive without communication, it is impossible for a priest or religious to survive without prayer. Communication is essential for any two persons who expect their relationship to continue. Can you imagine having a best friend to whom you never spoke? Since prayer is so important, most priests and religious spend approximately two hours a day in prayer—part of that time with others, at Mass and in common oral prayer; part alone, in reading and quiet attentiveness. Probably the main benefit of prayer is that it makes us more sensitive to God’s activity in the people, events, and circumstances of daily life. Definitely not! There are lots of times we don’t feel like doing things that are basically important to us. For example, an athlete doesn’t always feel like practicing, a student doesn’t always feel like studying, a wage earner doesn’t always feel like working. However, in all these cases, because the activity in which we participate is important, we act on motives deeper than feelings and do what we know needs to be done. If I’m thinking about giving seminary a try, what should I tell my girlfriend? Girls and dating are a part of life, and it’s ok to enjoy their company. When someone becomes a priest, he takes a promise of celibacy so that he can give himself totally to God and the people of the parish. Dating before you become a priest is important. Not only does it help you to grow in trusting another person and knowing what it means to build intimacy, it also helps you to understand what it feels like to fall in love, to experience a broken heart, to say goodbye to someone you care deeply for. So, back to the question…what do you tell your girlfriend? Tell her that you’ll always be friends and that what you learned dating her will make you a better priest and person. Remember answering God’s call (whatever it is for you) is the only way to true happiness and lasting fulfillment. Should I go to the seminary now or wait? This is the big question isn’t it? Obviously, I cannot answer the question for you. I also don’t think that this is a question that you can answer alone. Obviously, if you’ve completed high school (or are within a year of graduating), you are eligible to begin the application process. It is important to take time to seriously reflect and pray on this decision. It is a decision that your Vocation Director will help you with. You will always have doubts and fears. There is of course a risk that you take in going to the seminary. I believe that seminary provides the best opportunity for you to discern your vocation. Take the risk. You’ve got so little to lose and so much to gain! Why do some priests and religious wear habits or clerical garb? Those who maintain habits or clerical garb do so for various reasons. One is that religious dress is a sign – an instantly recognized symbol of faith in God and commitment to Christianity. Another frequent rationale is that religious garb is simple dress and therefore a way to live out the vow of poverty. A sister, brother, or priest who wears religious garb can own two or three changes of clothing and be free of the expense of a more extensive contemporary wardrobe. Other communities say the habit is an important sign of penitence. Some communities have opted to wear street clothes, saying the most valid sign of Christian faith is lifestyle rather than garb. Those who have discontinued wearing habits often say the original reason for religious garb was to wear the dress of the common people, and street clothes are the common people’s dress nowadays. There is certainly room in the Church for both expressions of religious life. What if someone goes to the seminary and then decides he doesn’t want to become a priest? Seminarians are not people who have everything figured out. In fact what they are doing is seeking God’s will, by putting themselves in a setting where they can truly discern God’s will. Spiritual direction and seminary formation are important components of this. If an individual decides priesthood is not for him, he is certainly most free to leave. Seminary is not a prison! The job of seminary is not to try to brainwash people or convince them that they should become priests, but rather to help them to truly discover God’s will and, if that is priesthood, to make them the best possible priests. Sometimes people are afraid to give it a try for fear of failure. There is no way to avoid risks in life. Everyone who goes to medical or law school doesn’t necessarily stay. I guess the old saying is true: Nothing ventured, nothing gained! After someone is ordained to the priesthood it is a little more complicated. After all, the person has made commitment to God and the Church, just like in marriage. Yes, unfortunately divorce does exist in our society and yes some priests do leave the priesthood for various reasons. No one is going to force anyone to stay. This is something which needs to be given consideration and one needs to look at any underlying reasons. Can a priest leave the priesthood? Yes. Should they? That’s another question entirely. The term “Father” was used in the early Church for those spokesmen who were defenders of Christianity as well as for beloved leaders, confessors, and well-respected spiritual guides. Today we use this term “Father” when addressing most priests simply as a sign of love and respect. Truly, even though every priest sacrifices a particular family, he gains a much larger family in the Church. People most often look up to their priests, ask for their help, guidance, and counsel. These and many others indeed are qualities of a father who cares for his family (the Church). A vocation is a call from God to do something specifically for God and for His kingdom. The primary vocation of every person is to be holy! It is the divine calling to love and serve God, to obey His commandments, and to cooperate with Christ in the work of redemption by loving and serving others. But we are all called to live that vocation in the particular way through which we are to be holy. There is the vocation of Single Life, Married Life, Parenthood, Deaconate, Holy Orders, Religious Life. You must pray every single day, asking God to reveal His plan for you. Do not ask yourself, “What do I want to do with my life?” This is the wrong question! Rather, you should be thinking and asking: “Jesus, what do You want me to do?” And listen for the answer! The primary locus of revelation is the heart. Listen with your heart! The discernment process in the priesthood must also include the Church. The local bishop is the one who ultimately decides who is and who is not called. He is assisted in this by the vocation office and the seminary. Can I be happy in my life if I do not follow God’s plan for me? If you do not follow the vocation for which God made you, you can attain a certain degree of happiness in this world, and still attain salvation (go to heaven). But you can never be as happy as you might have been, had you followed your proper vocation. This is why it is so important that you discern correctly. The discernment of your vocation is likely to be the most important decision you will make in your entire life! Of course, there are trials and tribulations in every vocation. To become a priest does not take away all suffering. But there is great joy in laying down one’s life for Jesus! Am I holy enough to be a priest? If God only called perfect people to priesthood and religious life, no one could legitimately respond. The Holy Father calls us all to “grow in holiness” and Jesus himself said we are to grow to be “perfect as our heavenly Father is perfect”. We aim high and do our very best. That is all that God asks of us. If God is calling you and this call gives you inner joy … your holiness, though incomplete at this point in life, is on the right path! A vow is a solemn promise made freely as an individual gives his or her Life to God. Many religious communities make vows of poverty, celibacy, and obedience. Some communities have other vows as well. Diocesan priests do not make vows but do promise to lead a celibate life and to respect and obey their diocesan bishop. They are also expected to live a simple lifestyle. Celibacy, in the religious context, is the means by which a man consecrates himself totally to God for the service of humanity. By celibacy a Christian sets aside the responsibilities and intimate relationships of family life in order to take on the responsibilities of serving the wider family of man. By a personal relationship with God in prayer, by the friendships and associations with married and single men and women, he grows in his love of humanity and becomes capable of serving God’s people more effectively. To be authentic, it must be inspired by a love for Jesus. Most priests are extremely happy in their vocations! The life of a priest is a very rewarding life, both in this world and in the next. The media often gives an incorrect impression of priests that they are largely unhappy, frustrated, and angry. This is simply not true. A priest engages in people’s lives at the most memorable times, both joyful and sorrowful – in baptisms and weddings, funerals and hospital visits. He celebrates the Eucharist with his congregation and brings comfort and meaning to modern day life in his homilies. Most diocesan priests work in parishes but some do specialized work such as campus ministry; prison, health care, and military chaplaincy; education; retreat and spiritual direction; and diocesan administration. Whatever kind of work he does, every priest tries to include in his life enough study, prayer, physical exercise, leisure and recreation. Together, this balance in life brings a high degree of personal satisfaction. Loneliness is a part of every vocation, at one time or another. It is part of the human condition. Married people get lonely at times, even though their spouses and children surround them. Priests are always surrounded by people. This is one of the joys of being a priest. We are involved with people at the most profound moments of their lives: birth, Baptism, Confirmation, First Communion, Marriage, and death. We don’t have enough time to experience loneliness often! But when we do experience loneliness, Jesus can fill that void, as He does for people in every vocation. Priests do not get paid in the same sense that people in the business world are paid. Because a priest does not have a family and because he lives a simple life, he does not need a lot of money. However, priests do receive enough money to buy their necessities, to buy and maintain an automobile, to take a vacation, and to do normal recreational activities. Also, priests are given free room and board by the parish for which they work, so their expenses are minimal. Do priests get time off and what can they do with it? We have approximately the same amount of leisure time as most adults. In this time, we are free to do whatever is legal, moral, and reasonable for adults in our situation. Some of the more common activities are sports, movies, TV, reading, sharing with friends, enjoying the outdoors. Yes, we are. Nothing happens to us at the time of entering the seminary that eliminates normal human needs, feelings, or desires. As celibate men, we choose to channel these feelings and express our love for others in the wide range of means other than those physical expressions restricted to and proper to marriage. However, priests can and do have chaste friendships with women. Priestly formation programs discuss openly the topics of celibacy and the needs that men seeking to follow Christ as a celibate priest have. This is an important part of our priestly formation program. Experienced priests reviewing our formation program have stated that Mundelein Seminary prepares men in human and spiritual formation for a healthy life of celibate love much better than in years past. There are four main areas of study and development in preparing for the priesthood: human, spiritual, the ability to minister (pastoral) and academic. Spirituality, the study of prayer and the development of one’s relationship with God, is covered mostly on an individual basis, with each man meeting with a priest-advisor. Ability to minister is developed in supervised programs. If a man goes to a college seminary, he has the same classes as a regular liberal arts college with the addition of classes on Philosophy, the Church and God. After college, he enters Theology, where his time is spent studying the Bible, the teachings of the Church, and the skills he will need to be a priest. In no way. In fact, most vocation directors agree that the only way to really know that you have a vocation to the priesthood is to go to the seminary and try. It will become more and clearer to you once you are in an environment where everyone is trying to discern that same question. Many men go to the seminary, stay a year or two, and then leave. They are much better Catholics afterwards for the experience. Can I afford to go to the seminary? Every vocation is a gift from God, and given the importance and dignity of every vocation that God gives to the Church, every diocese and religious community has in place some policy to address such concerns. No one is turned away from studying for the priesthood or from religious formation for lack of financial resources. Do I have to be an ‘A’ student? 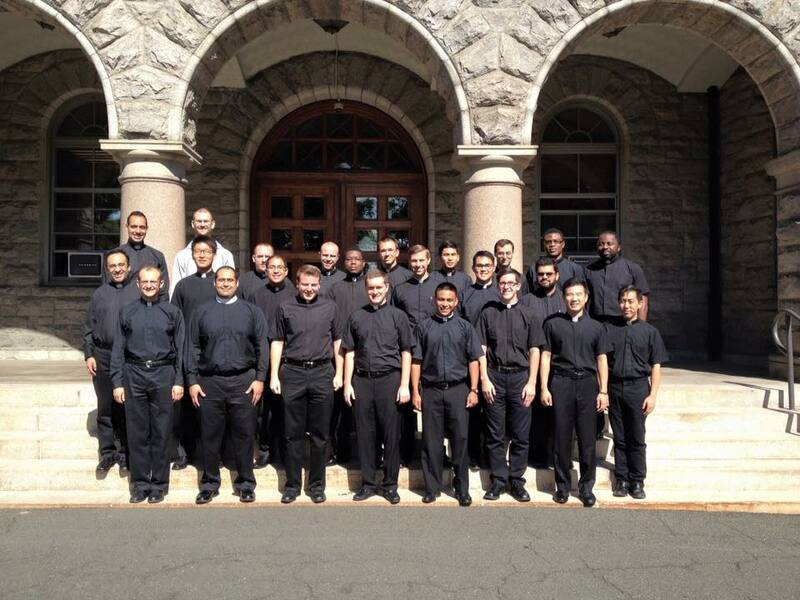 A seminarian should be an average or above average student. A priest need not be a “brain,” but on the other hand a priest must have the ability to pass the courses the seminary requires in order to serve the Catholic community well. How many years will I be in the seminary? Generally it takes four years after college or eight years after high school to become a diocesan priest (the same as for many professions). For men entering the seminary who already have a college degree, two years of philosophy (called the “Pre-Theology” program) are usually required before they may enter the theology program.